We are working with the Ontario Fruit and Vegetable Growers Association to explore ways of reducing crop damage caused by wildlife. One of the deterrents being tested is the use of nest boxes to encourage kestrels to nest near orchards, berry and vegetable crops. American kestrels are a natural predator of smaller bird species, insects, mice, and voles that damage fruit crops. They are also very territorial and will drive other birds out of their territory which ranges from ½ to one mile. 1. Nest boxes should be placed in open fields, meadows or along hedgerows next to open areas. A grassy habitat should be near the box so kestrels can use it for hunting. 2. Kestrel nest boxes should be firmly attached to a support structure, such as a tree or post, 10 to 30 feet above the ground and spaced at least half a mile apart. 3. The support structure should have a sheet of aluminum secured around it to prevent squirrels from climbing and using the box. Keep in mind that squirrels can jump up to five feet vertically and 10 feet horizontally. 4. Boxes should face the southeast if possible. 5. Place 2 to 3 inches of wood shavings in the bottom of the nest box. Kestrels don’t build nests out of twigs. You want nice, clean shavings that do not have sap as it can irritate their feet, no pine, walnut, etc. 6. Boxes should be installed no later than February 1st, to allow kestrels to find nest sites when first returning north. 7. Since starlings may use the box, check the box once a week and remove the nest and eggs of any starlings present. Starlings are unprotected by law and thus you are permitted to do this. Starling eggs are white with a blue-green tint, but other species such as bluebirds (bright blue eggs) and tree swallows (white eggs) may also use the nest box. Be sure you can identify the eggs, but when in doubt, wait for one of the parents to return for positive identification. 8. 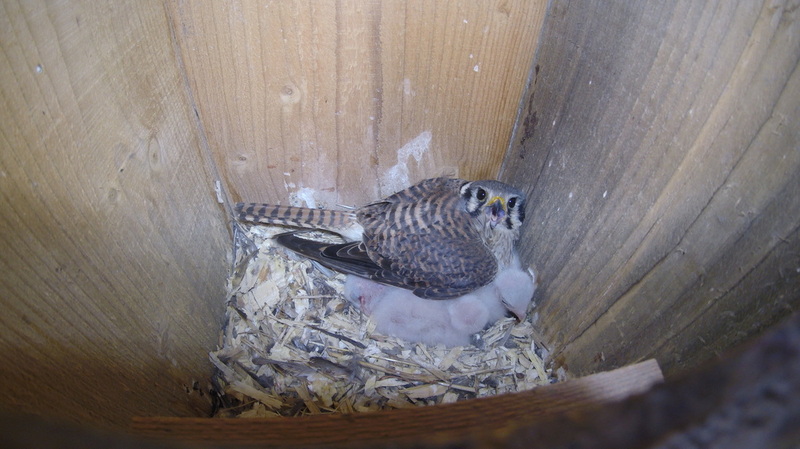 Clean out the kestrel box after each nesting season and replace the wood shavings for next season's nesting pair. White to yellowish or light reddish-brown, mottled with violet-magenta, gray, or brown. Feeble, with sparse white down over pinkish skin; eyes partially open by first or second day.